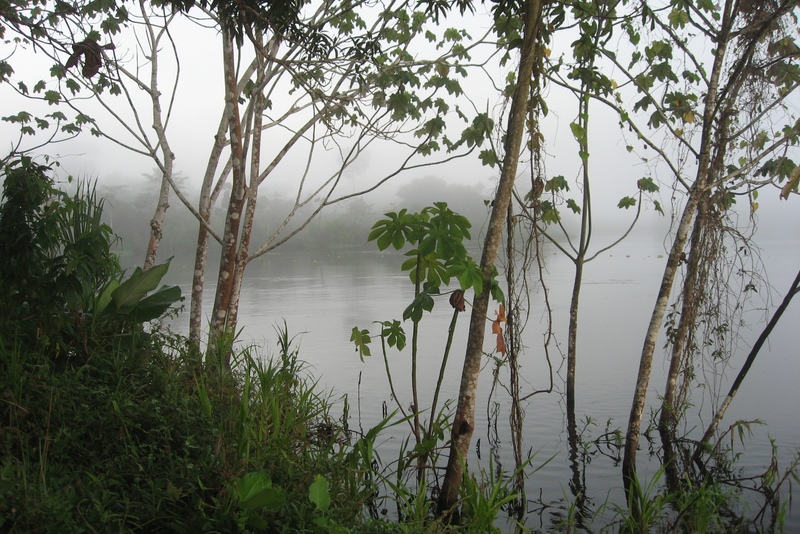 In 2009 my daughter announced that she was taking a 6 week field course in the Amazon. I immediately announced back that if she was going to the Amazon, then I was going, too. I had ALWAYS wanted to go to the Amazon! 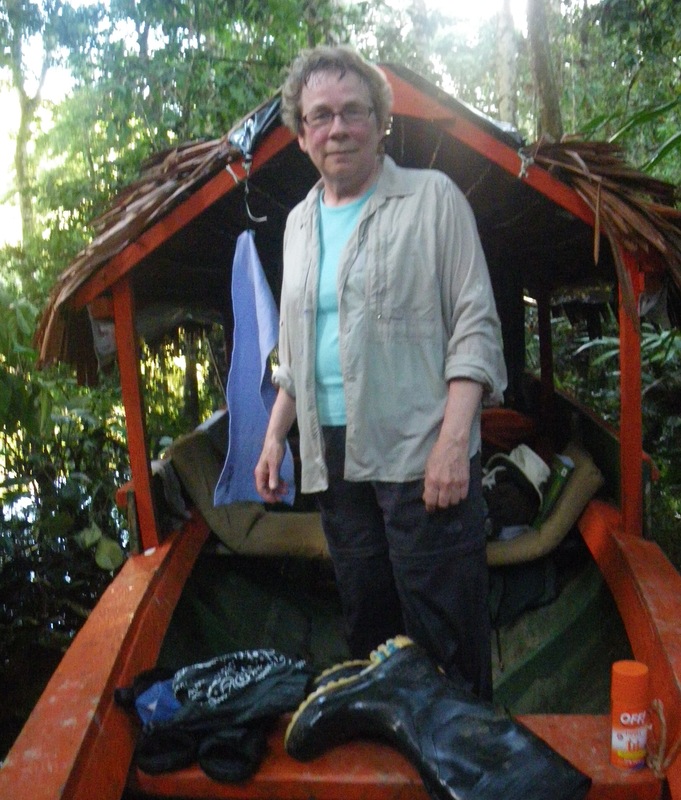 I arrived in Iquitos just before her course finished, with time to venture into the jungle myself before joining her to travel onward. Here is my post from that time. 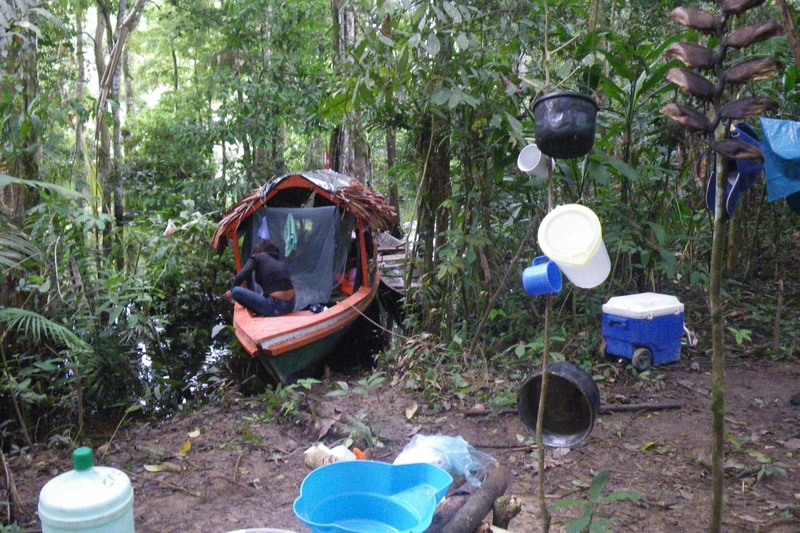 Last night I returned from 3 nights in the Amazon jungle. The arrival back in town was a little impeded by the remnants of a blockade that was put up by a group of indigenous supporters protesting some new law that threatens their land. I don´t know quite where to start. I have always been fascinated by the idea of the Amazon, and I loved the jungle! I left Sunday morning with a 25 year old female guide, and we picked up an assistant and a boat in the town an hour away. They spoke only Spanish, which was one of the reasons I decided to go with this guide. I learned my Spanish in Venezuela as a 20-something-year-old, and it is fairly fluent but very rusty. I needed some immersion. We arrived at village called 20 de Enero just inside the Pacaya Samiria Reserve, where development and activities are very restricted. Stayed in a house on stilts – owned (or at least used) by this small guiding company. It was very typical. 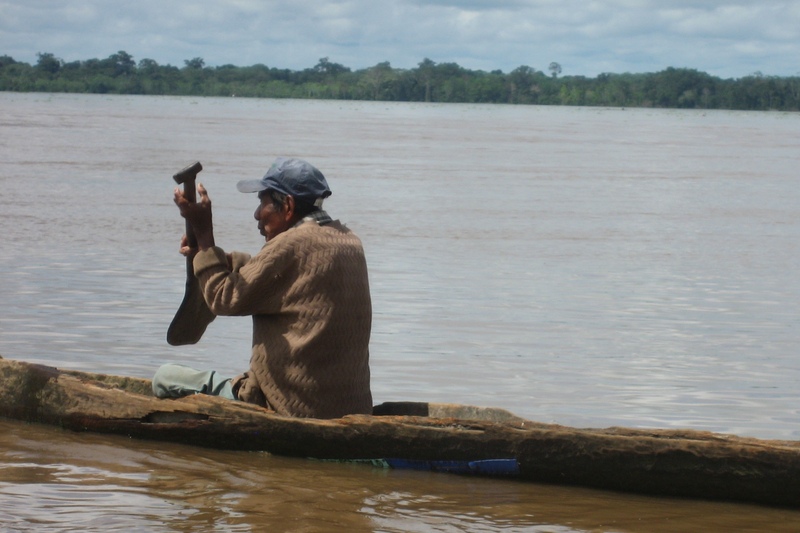 Because the Amazon waters have been higher than in 30 years, many areas are flooded that are usually above water. Our house was surrounded by water (1 or 2 feet deep). No bathroom – shower or toilet. The floors are made of a reed-like wood, with gaps all over the place. So if you need to pee in the night, you do it over a part of the floor that seems to have more gaps. Then in the morning you can toss some water over it. All drains into the river. Fortunately I did not need to do anything major – otherwise I might have had to pry open a larger crack in the floor! Went a ways upriver to Buenos Aires, a smaller village. The guide company is getting a cabin built there, so we slept on the wooden platform that is the start of the house. It was 50 m from a family´s house, which was 500 m from the main part of the village, which has maybe 15 families. We chatted with the children, bathed (that will have to be another story) and then got ready for bed. I was in a hammock with a mosquito net house around it. Vicky was sleeping in a mosquito net house as well, but just on a mat on the ground/platform. I was secure and comfy in my bed when I heard her call the 11 year old boy “Bring me your machete, there is a jergon here.” We had been talking about frogs, and one large one that is edible. I thought that was what she had found. The boy came quickly and I heard WHACK WHACK a few times. 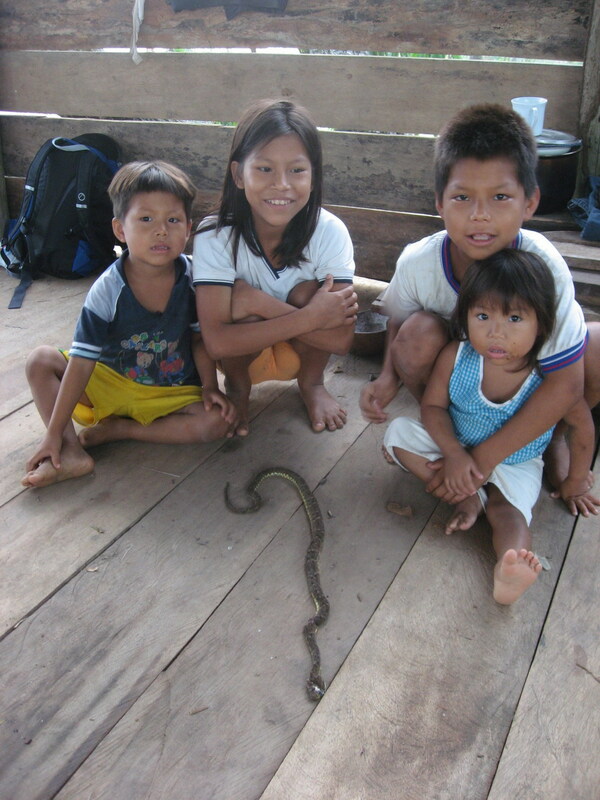 Then “Senora Clara, do you want to see one of the most poisonous snakes in the Peruvian Amazon?” Of course I did, but I didn´t want to get out of bed, so the boy brought it over to me on his machete. It was a lancehead (fer de lance), about a metre long, and had been right by her bed and the place where she had been sitting. The next morning we all admired it, but it was not so impressive after its encounter with Vickie and her machete. Vickie seemed genuinely a little perturbed by her close encounter. 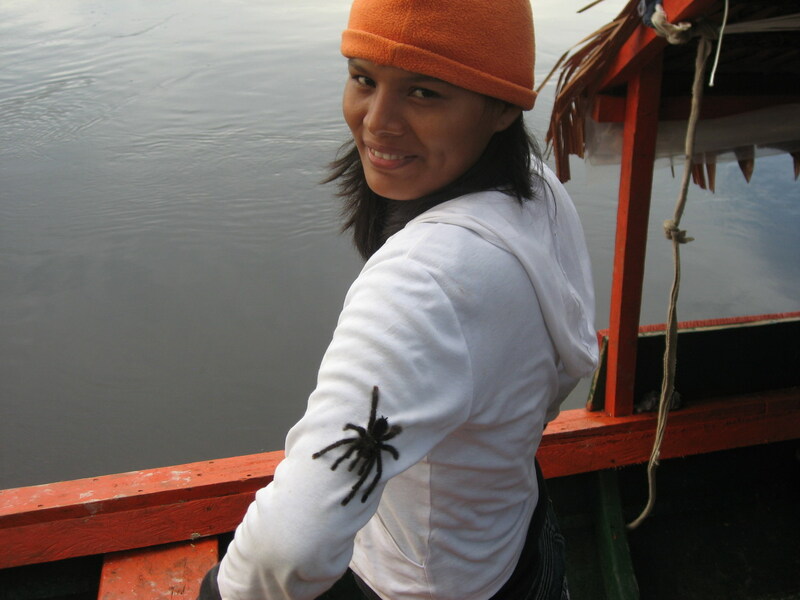 Oh I forgot to mention that when we arrived at this spot, Vicky found a tarantula in the water and let it crawl up her arm. The children were quite nervoous about of it. Next day we walked to the village, saw the people making a canoe, threshing rice, washing clothes (they do a lot of that), etc. The people in all of these villages are campesinos, rather than true indigenous communities. 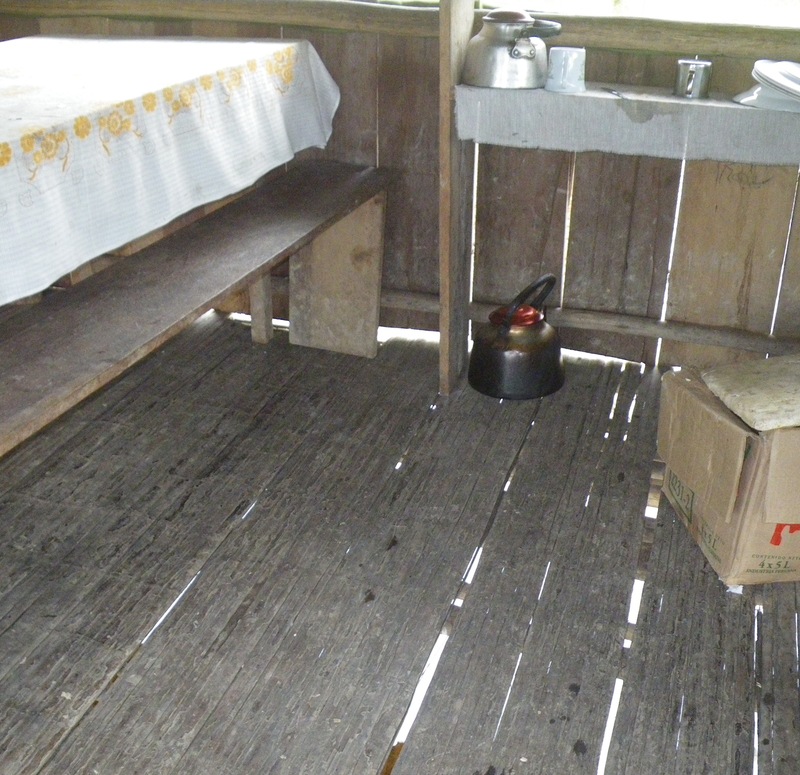 My sleeping accommodation was the same as before, between 2 trees but the others slept in the boat on the benches. Meanwhile we had picked up a 16 year old from the first village, who had never been camping before. We went for a walk in the jungle. Many ants, another poisonous snake but much smaller, vines to swing on, etc. Got to an inundated area and tried to walk back through it, in our high gum boots. Struggled to step such that the boots stayed dry but eventually gave up and we walked through knee deep water. After awhile we had to turn back to retrace route because the sun was going down. We laughed and they said “Senora Clara thinks we are lost.” I said that it was hard to believe that tourists paid money to do this, and they must think we are crazy. They thought that was pretty funny. I put on my last dry clothes to sleep in. I had my not-waterproof camera in my shirt pocket when I was squatting at the riverside washing my face in the morning. Of course, it fell into the river. I was able to quickly retrieve it but damage was done. Fortunately the memory stick was okay, and I did have my daughter’s waterproof camera as a backup. But unlike me, the camera was not a happy camper. That day we puttered about in the boat and the canoe to see macaws, some special plants, returned to 20 de Enero to make lunch. I asked some local girls to wash my dirty clothes. Then I was walking through the knee-deep water in boots to their raft, and I slipped on the clay drop off and completely wet my last dry outfit (see the photo of me standing in the water afterward). My passport and N´s waterproof camera were baptized. 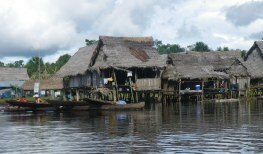 Returned to Nauta (city) and had to take multiple-passenger taxi back to Iquitos. Our official driver hadn´t been able to get out of town because of the blockade. However, we were told that traffic was now moving. We made it through the piles of garbage bags, rubble and dirt that had been placed to block traffic. The camera is still not working properly but maybe it will once it dries completely. (Hard to do in 90% humidity.) My favourite photo of the whole trip is this one – the last one taken by the Canon camera before it jumped into the Amazon (actually a tributary thereof).